Someone colse to me I no longer see. The lord has taken her from this Earth with a better purpose in mind. She now lives in the sky above with the clouds to jump around on. as she may be gone she still lives in the memories of all of us. As she passes through the big golden gates the welcoming angels wait. As she passes by the angels they greet her with hugs and kisses. As she walks up to go to receive her wings to exspand. He said to her you are you unique indeed so here take these purple wings. As she put them on angels began to cheer and clap. Hurray! Yay! Today is your special day. As she stands and watches over all of us she smiles and says hey I'm okay. I know you all will miss me and I'll miss you to but god has a grander plan for both me and you. So don't worry I'll always remember all of you will remember me too. Because I will always be in your memories and love you all. But don't forget I'm always watching over you. She spreads her beautiful big sparkly purple wings. Then a ray of light shines on her as she takes off in the wind and fly's away. As she looks down she says live with your eyes open don't let anything pass you by especially the small things. Never give up on your dreams and believe and let my purple wings help lead you on your way. Moderngirl Uploaded by Moderngirl on Jun 19, 2014 . 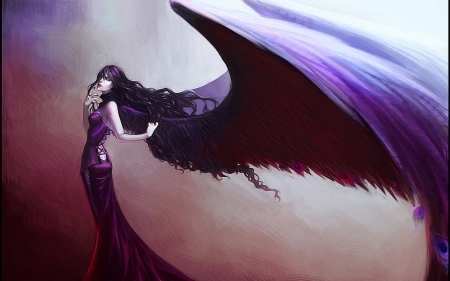 Purple angel - Desktop Nexus Anime Download free wallpapers and background images: Purple angel. Desktop Nexus Anime background ID 1776756. Someone colse to me I no longer see. imagine that these wings hug u !